Palmate Newt is a small newt species mainly found in Western Europe. These newts are protected by various laws in the countries they exist. They are considered to be threatened in many countries including Belgium, Luxembourg and Netherlands. In Spain and Poland this species is considered to be vulnerable. They are one of smallest newt species in the world. The adult females look quite similar to the female Smooth newts. Palmate Newts have a shiny appearance. 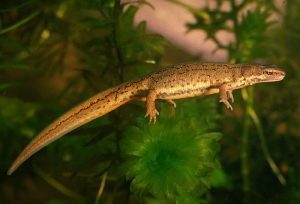 Size: These newts generally grow between 8 cm and 10 cm. The male newts are slightly smaller than the females. Their larvae are 8 mm to 10 mm long when they hatch. Color: Both males and females are brown or olive-green in color. They sometimes have dark spots covering their backs. The pale orange or yellow belly may or may not have dark spots. Females have pale yellow or pink throat without any markings. This helps to identify the female Palmate Newts. Body: The two ridges running along the back of the males give them a box-like appearance. These male newts develop a low, smooth crest along their backs during the reproductive season. The crest becomes slightly higher near the tail and ends in a threadlike tip. The males also develop enlarged cloacal regions before the mating season. Head: They have a dark line running across the sides of their head and through the eyes. Feet: The webbed hind feet of the males are developed during the mating seasons. These feet look like the palms of human hands. 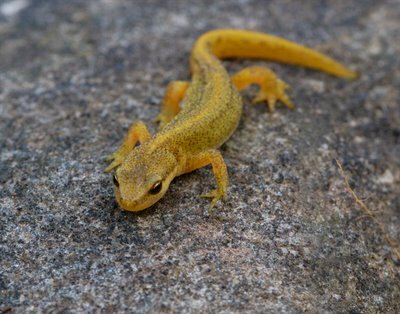 Tail: The newts of this species have long tails with an orange line along its center. Their tails are also marked with rows of dark blotches. Palmate Newts are found in the western regions of Europe including Great Britain. Their distribution range includes United Kingdom, Wales and Scotland. These newts inhabit lakes, ponds, marshes, canals, forests and agricultural lands. They are sometimes found in moorlands and coastal areas. This species spend their mating season in water. But they can tolerate dry conditions and are found away from their watery habitat during their terrestrial phase. The diet of this carnivorous species consists of various invertebrates, planktonic animals, small crustaceans and frog tadpoles. They are known to display occasional cannibalistic behavior. They are nocturnal in nature, being active mainly during night. 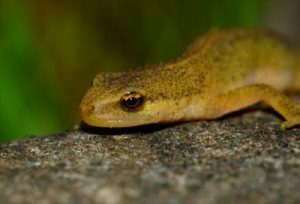 Palmate Newts are most active in rainy and humid conditions. During the mating season, the newts remain active both in day and night. They use their sticky tongues to capture preys. 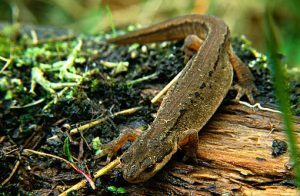 Various large fishes and grass snakes are considered to be the main predators for this newt species. Other predators include kingfishers, ducks and great crested newts. Water beetles, large fishes, dragonfly nymphs and larger newts feed on the larvae. Their slender bodies help them to swim. The small toes help them to hold on to objects like rocks and tree branches, especially during their hibernation. During the mating season, the male Palmate Newts develop webbed feet that help them to move in their water habitat. The mating season for this amphibian start in April and continues through May. They attain sexual maturity at 2 years of age. Mating takes place in water. The male and the female newts move to the mating ponds after they wake up from hibernation. The females lay 100 to 300 eggs in water. These eggs are individually attached to plants and vegetations growing under the water. In warmer areas, these newts may reproduce twice in a year. 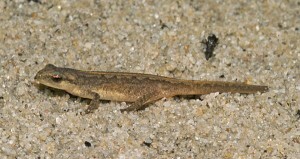 The Palmate Newt eggs take around 2 to 3 weeks to hatch into larva. Feathery external gills are located behind their heads. These larvae start to metamorphose 6 to 9 weeks after hatching. In extremely cold regions, the larvae spend the winter within the water. They start their metamorphosis in the next year. The larvae leave their water habitat and move to terrestrial land, once they lose their gills. The adult newts hibernate from November to March. Hibernation generally takes place on dry land under stones and logs. They may occasionally hibernate in water. The average lifespan of this newt is around 10 years. This newt is quite easy to take care of and can make a great pet. It is a semi aquatic species, which means it needs both land and water. Here is some information about its housing, feeding and caring. Housing: A ten gallon tank is ideal for a couple of Newts. Half of the tank should contain water and the rest should be land. It is ideal to place large pieces of wood in the tank to provide the newts with hiding places where they will hibernate. Feeding: One can feed them with small invertebrates and worms. The pet newts can be provided with a suitable protein supplement once a week, after expert consultation. Handling: It is advisable to wear protective gloves while handling these newts. Handling them should be avoided unless it is absolutely necessary. These Newts are included in the “Least Concern” category by the IUCN, which means there are no immediate threats to their existence. But they are considered to be threatened in many areas where they are found. Their larvae look almost identical to the Smooth newt larvae. This is the smallest species of Newt found in Great Britain. They derive their name “Palmate Newt” from the palm-like appearance of the webbed feet of the males during mating season.